As a new year begins, we reflect upon the last one and set goals and expectations for the new one. New-year resolutions? Why not. Regrets? Hopefully not many. Whatever the past holds or future desires are, the staff at SmartyPlants wishes you all the best in 2012. We look forward to seeing you and to being here for all your gardening needs. Seems like only a few days ago, we were bragging to our family and friends who don't live in South Florida about the warm weather we were experiencing. That quickly changed, but compared to the rest of the country, we can't complain. I still do, and if they could, so would the plants at the nursery. Like in your yard, many of them are more sensitive than others to cold temperatures. It's good to know which ones need more protection and which ones can take the cold. To protect entire planter beds, frost cloth cut to size is recommended. For the "special" plants that can't take the cold, you may protect them individually with plant hoods, or plant sweaters as we like to call them. These are made of breathable fabric, like the frost cloth, and are also great to keep pests away. 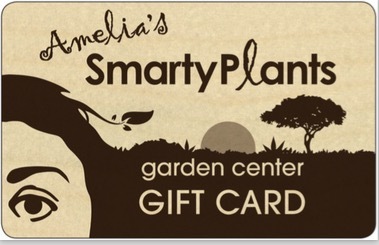 Both types of protection are available at SmartyPlants. After cold snaps, you may notice some leaves turning yellow and dropping. This can be expected this time of the year, but don't assume that cold weather is the reason. Too much water can also cause this as well as pest infestations. Because we've had such warm temperatures, pests are happily reproducing out there. So be vigilant in your garden. Inspect under leaves looking for aphids and other critters that hide. Plants have been a little confused because December was so cozy, so you may have observed some unseasonal plant growth. This can lead to nutritional deficiencies due to the additional energy plants have spent growing. Look for dark greening of the veins in the leaves and leaves which have turned limey yellow (see tips below). Nutritional deficiencies - The rate at which slow-release granular fertilizers dissolve is a function of heat and moisture. So, this time of year (dry and cool/cold), it's best not to apply fertilizers because they won't dissolve. But if your plants didn't get fed earlier this season, and they are showing signs of hunger, foliar applications will give them quick light nutrition boost until the spring feeding. Less water - You can reduce the amount of water you give your plants since temperatures are lower now than in the summer. Too much water can also cause leaf yellowing and leaf dropping. It will also dilute any amount of fertilizer that may still be in the ground from warmer/wetter conditions. Remember the plants' growth cycle has stopped or slowed down significantly so they don't need as much water. You may reduce your watering time and/or amount. Good time to plant - We are often asked if now is a good time to plant. The answer is yes. You won't get a whole lot of growth in the next 2 months. However, the new plants will have a chance to acclimate slowly to their new environment, and they will require less water to get established than if you plant them in the hotter months. They'll be ready to spring up when spring arrives and slowly ride into the heat of summer. Ideally, the best time to plant is when temperatures are not too hot, not too cold, and rain falls frequently - not too much; not too little. Good luck trying to predict those conditions. So realistically, the next few months are good for planting in South Florida. Frost Cloth - The roll of frost cloth is 15 ft. wide, and it is available in one foot lengths. So each foot you purchase covers 15 square feet. Wall Art - Although wall art is not new, it's on sale this month. When used in combination with plants and other hardscapes, it can truly transport you to your favorite place (see left picture below).